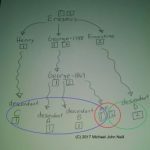 Casefile Clues–information on my genealogy how-to newsletter which focuses on analysis, interpretation, and methodology through case studies and document analysis. Genealogy Transcriber—one piece of handwriting every day–can you read it? Please let others who may be interested in these blogs know about them. Subscription and unsubscription options are on every page of the blog and in every update email that is sent out.